I’ve been fascinated with mosaics since I took a tour of the upper mosaics of San Marco in Venice. I believe I never really stopped and thought about the intricate nature of the art form. I even saw mosaics designed by Tintoretto! However, the art form is not really the main point of this blog, although I will leave you with a technical description of the process. What fascinates me about the mosaics at Hammam-Lif (near Tunis) in Tunisia is what they represent in a broader sense about humanity. Here are Roman mosaic artists decorating a Jewish synagogue! There have always been points in history where cultures (regardless of religion) have co-existed peacefully and profitably! I’ll throw a few instances out: Nasrid (Islamic) Spain (1232–1492); Cochin, India; and yes, many cities within the vast Roman Empire. The lesson contemporary human beings have yet to learn is that we can learn from each other for mutual benefit. As you all know, a mosaic is a pattern or picture made by embedding small pieces of stone or glass (the pieces are called tesserae) in cement on surfaces such as walls, floors, and ceilings. Mosaics seem to have originated in the Mediterranean region, primarily invented as inexpensive flooring of pebbles. Artisans soon discovered that pebbles of varying colors could be arranged to form decorative patterns. Pebble mosaics were popular throughout Roman times because pebbles were durable and cheap. Romans were interested in realism in their sculpture and painting, and desired mosaics, too, to have more pictorial realism. The Romans began cutting stones into desired shapes, which revolutionized mosaic-making. Despite official intolerance, Jewish communities thrived throughout the Roman Empire. Carthage, which the Romans wiped out in the BCEs, eventually was rebuilt (contemporary Tunis) as a major port and source of wheat and other commodities during the first century BCE. Like many of the cities in the far flung regions of the empire, Tunis became a cosmopolitan center of art and cultural life, including a large, prosperous Jewish community. 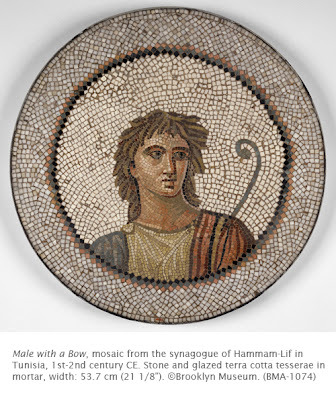 What is novel about Hammam-Lif is that synagogues were decorated with human and animal figures (frowned upon in most Israeli art in the ancient period). Interestingly, the Jewish people (like the early Christians living within the Empire) had to rely on local (Roman) artists to decorate their synagogue. This mosaic is profoundly Roman in style, and the symbolism within a synagogue is an open question. What is amazing to me, regardless of where the Romans spread their influence: Look at the nuances of shading in the figure’s face! This was done by multi colored stones and clay tesserae! Activity: Cut small squares out of pieces of different colors of construction paper. Pick out a design, such as a face, plant, or abstract pattern, and glue the squares to a black piece of paper. The black paper will form a background that can indicate lines within the design.